A major financial redesign of the sector to better spread the costs, risks and benefits amongst the multiple stakeholders (learners, taxpayers, employers and edustrial providers). We begin this series by examining the trend toward Real Education. A trend we think will prove highly transformative and influential as far as to where the demand for education is heading. Post-education generations expected to be in dire need of proven real-time learning solutions to sustain their job performance and increase their professional longevity. Especially now that they realize their retirement is further away and that this new economy is putting them at risk of losing their job to younger generations and global competition. All in all, we think the previous trends should be considered as having the potential to create a state of considerable flux demand-wise. As such, it should be seen as a major reality check as to how education systems will need to adapt and compete in the future. We believe the need for real content will also be a determining factor as to where demand for education will be heading in the coming years. It used to be that content and curriculum creation was rather supply-sided. As the clientele grow wearier of their prospects in a less welfarist society and a more competitive economy, we expect the education pendulum to swing back in favor of a more utilitarian regimen in which content value will be increasingly determined by real market value. As such, we expect abstract-ivory tower conceptualizations, dead-end programs and one-size-fits all academic content to fall victim to a much needed major overhaul. That is not all. In our view, real content will also be about creating next-generation content, or more rightly so, education applications. Applications which will be more attractive, innovative and engaging. Similar to what we are seeing in the mobile telephone market, we expect demand to be driven in no small part by an innovative application market that will not only allow people to learn better and faster but they will do so by being given the proper tools to emulate what the best individuals and organizations are doing to champion the new economy. As we will discuss later on in this series, we expect current education networks having no choice but to eventually relinquish their stranglehold as primary content providers and to turn to a much more open, innovative and well-funded content pool (edustrial marketplace). 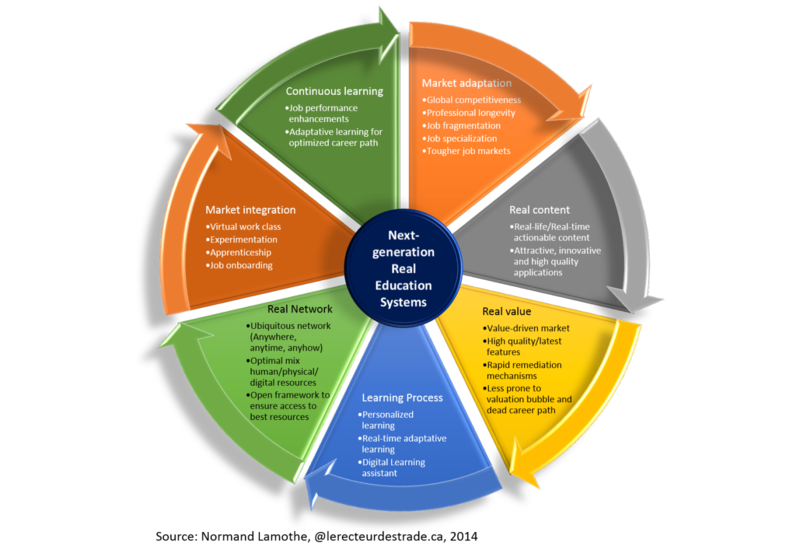 Getting real about capturing future demand also mean for education networks to operate at true face value. As we know it, education is currently one of the most imperfect market there is. Under the umbrella of an institutional aura few dare to criticize, we find a market stuck in the past, which deliverables and quality is highly variable, often poorly assessed and subject to rigid remediation mechanisms. As competitive pressures build up – sector and global-wise – and public subsidies recede, we expect this market to become more price-sensitive and more value-driven. As demand increasingly dictates level of revenues, we expect the sector to be less-prone to an education bubble, political representation, corporatism, dead-end programs and overall bureaucracy. We also expect education management to have a much clearer path to undertake their content and system retooling for achieving maximum societal and economic value while being less complacent toward maintaining their current cost/debt-ridden elephantesque structures. As part of the necessary changes brought on by competition and new customer demand for a more modern value-driven education, we also expect education administrators to take a long hard look at their network, delivery model and learning process. I expect demand-driven management to eventually come to terms with the fact that education networks based on standardized knowledge and a closed network of schooled-tenured and single-discipline professors is fast becoming an outdated delivery model. I also expect them to realize that technologically-wise we are facing are on the verge of a game changing situation as new ways are coming on stream to personalize and accompany individuals and groups during the learning process, both physically, humanly and digitally, in order to considerably expand their breath of knowledge and their assimilation rate. All of that at a fraction of the cost of current systems (more on that topic in the next installment of this series). Getting real is also about the need to break the glass ceiling between the world of education and that of the rest of the world. For that to happen, we need a system that doesn`t just teach but provide both real-life and job market integration. As opposed to pseudo general knowledge, which often stands for standardized and abstract learning driven by academic/bureaucratic-prone faculties often working on pet topics/projects/learning methodologies and some abstract representation of the world, we need a more entrepreneurial, market-driven, fast-evolving education application system which favors experimentation, work involvement, industry collaboration and situational learning. We also need a system which resets its balance more in favor of the general demand for applied knowledge, job acquisition and onboarding. As it now stands, we dare to say the education marketplace needs to be less book-smart/grade-smart and more work-smart, people-smart and brain-smart. For that to happen, we need education to become a real and open system in which employers, market-driven edustrial providers and learners have a bigger say than far-seated governmental entities, educational bureaucracies, life-tenured individuals and unions. To me that is the only way we can insure the system works best for the great majority and that we have resources that are the most helpful to help people find niches and have the necessary tools they need to adapt to whatever social and economic trends is coming their way. Finally, it is important to realize the representation we have of time spent in school to get a degree in order to get a job is over. As jobs become more fragmented, competitive, complex and with a shorter time span, we need an education system that will make learning not just an asynchronous process but a real-time continuous process. One that will be needed to help everyone stay on top of things through such things as immediate job performance enhancement and solutions to sustain professional longevity. Since this is where the biggest non-subsidized pool of revenues will lie, we expect the growth of this market to be the biggest market trend in the future. We also expect this post-education after-market to be the tail that wags the dog. Because of all the changes in resources and content it will require, it will be the biggest driver in making the next-generation education networks more real. And for those who will succeed in this market segment, they will probably be in the best of shape to tackle other significant chunks of the education marketplace since they will have more real content and integration tools to show for.